Provide comfort for the family of Clara McGregor with a meaningful gesture of sympathy. Clara Elizabeth McGregor, 85, of Kimball, SD passed away peacefully surrounded by family members on Monday, April 15, 2019 in Sioux Falls SD. Visitation will be held at the church from 5:00 – 7:00 P.M. Tuesday, April 23, 2019 with a 7:00 P.M. Wake Service and Rosary. Funeral Mass will be held at 10:30 A.M. Wednesday, April 24, 2019 at St. Margaret’s Catholic Church in Kimball. A Committal Service will follow at St. Margaret’s Catholic Cemetery. Mount Funeral Home of Kimball is assisting with arrangements. Clara Elizabeth (Janish) McGregor was born on November 9, 1933 to John and Clara (Heirigs) Janish in Lyonville, SD. She graduated from Kimball High School in 1951 and went on to attend National Business College in Rapid City, SD. On August 1, 1953 Clara was united in marriage to Wallace McGregor at St. Margaret’s Catholic Church in Kimball, SD. She was employed at Ellsworth Air Force Base in Rapid City and lived in Lake Elsinore, CA while Wallace was stationed at Camp Pendleton during his service in the US Marines. After his honorable discharge, they returned to Kimball to raise their family. Clara was a member of St. Margaret’s Catholic Church, active in the Catholic Daughters of America, and taught CCD classes. Later in life, she worked as a Teacher’s Aide in the Kimball School District; because of her nurturing nature, the kids loved her. An excellent cook and baker, Clara was famous for her divinity, homemade bread, and pies. Having graduated as Valedictorian of her Senior class, Clara sustained a lifelong love for learning and games, especially word games and puzzles. She also enjoyed bowling, drawing, reading, sewing and taking walks. Clara was exceptionally resourceful, eloquent, intelligent, and graceful. Grateful for having shared in her life, Clara is survived by her husband of over 65 years, Wallace McGregor of Kimball, SD, and her eight children, two sons-in-law, 31 grandchildren and 32 great grandchildren: son-in-law, Terry DeBoer of Sioux Falls, SD and his children: Matt (Kelli) DeBoer – Athena, Daphne, Jordan DeBoer and Carly (Justin) Thiner – Remy, Sloane; daughter, Jeanne (Terry) Krome of Mitchell, SD and their children: Tyler (Kristen) Krome – Evie, Rylie, Kiera, and Ryan (Jeana) Krome – Kruz, Kash, Knox; son-in-law, Harris Larson of Brandon, SD and his children: Charity (Clint) Lamb – Nevada, Clint (Bobbi) Larson – Andy, Ally, Josh Larson, Quynn (Philip) Steichen – Einar, and Logan (Connor) Smith; daughter, Sue (Jim) Benda of Kimball, SD and their children: Jay Benda, Lauren (Joey) Braaten and Ryan (Andrea) Benda – Peyton, Riley; daughter, Carol (Mark) Broderson of Sundance, WY and their children: Erica (Eric) Hoese – Cade, Ryann, Jace, Kyle (Megan) Broderson – Kayl, Morgan, and Kirk Broderson; daughter, Nancy (Brad) Bauer of Mitchell, SD and their children: Stephanie McGregor (Paul Kooiman), Jaime (Andrew) McCarrier – Tatum, Easton, Nolan, and Michael Bauer; daughter, Kathy (Jim) Stern of Mitchell, SD and their children: Kristin Stern, James Stern – Hayden, Kelsey (Nick) Stern, and Katie Stern; Russ (Carla) McGregor of Watertown, SD and their children: Royal McGregor, Alexandra McGregor (Nick) – Khira, Hailey McGregor (Wade) – Hazel, Haven, and Grace McGregor; daughter, Diane (Ryan) Stadem of Sioux Falls, SD and their children: Claire (Nicholas) Fuselier – Aleksandar, Autumn Isburg – Odin, and Mallory Isburg; daughter, Darcie (Mike) Walker of Rapid City, SD and their daughter: Adriana McGregor (Shawn) – Jaya, Charlee; sister, Margaret Reuland of Sioux Falls, SD; brother, Ray (Doris) Janish of Yankton, SD; six in-laws: Ralph (Bonna) McGregor of Parkston, SD, Pat (Marlene) McGregor of Chamberlain, SD, Catherine (Leo) Hart of Mission Hill, SD, Patricia McGregor of Watertown, SD, Clarice McGregor of Texas, and Don McSparren of Iowa, along with many nieces and nephews. Clara was preceded in death by two daughters: Yvonne DeBoer and Patricia Larson; a granddaughter, Danelle Larson; her parents, John and Clara Janish; five siblings: Albert (Lorraine) Janish, Sr., Loretta (Walter) Fuegen, Louis (Dorothy) Janish, Leona (Bill) Young, and Maxine (Bob) White; her parents-in-law, Louis and Ellen (Geppert) McGregor; four in-laws: Bill McGregor, Leonard McGregor, Paul McGregor, and Mary Ellen McSparren. 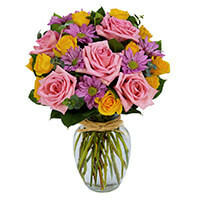 To send flowers in memory of Clara Elizabeth McGregor (Janish), please visit our Heartfelt Sympathies Store. We Love You, Mama. May you Rest In Peace. You’re our Special Angel watching over us, & you’ll Always be in our Hearts. Darcie & Mike Walker Family purchased the Spring Brilliance Bouquet for the family of Clara McGregor.